David Villa Sánchez was born in Oviedo, Asturias, Spain, December 3, 1981, he was given the nickname El Guaje (The Kid in Austrian) David Villa started his career in 1991, joined the club UP Langreo. In 1999 he moved to the professional club Sporting De Gijon. In the season with Sporting de Gijon first he can not be a core player, but in the following season he became a regular player with 18 goals in the league creating continued with 20 goals in the following season. By scoring more than 50 goals in the past three seasons he became one of the most fertile in Laliga goalscorer. In 2003 he moved to Real Zaragoza promotion team. Together Zaragoza he did not have any problems in adapting with the other players and he created 17 goals in his first season with Zaragoza. played two seasons with Zaragoza he was transferred to a big club Valencia in the summer of 2005 with a price tag of 12 million euros. 2005-2006 season he became top scorer for Valencia with 25 goals from 35 games, where he lost 1 goal from Samuel Eto'o of Barcelona's top scorer in Laliga. He scored a hat-trick for Valencia against Athetic Bilbao on 23 April 2006. Earlier on March 14, 2006 Villa Valencia to extend the contract through 2013. Since 2010 until today, David Villa playing for Barcelona. For the Spanish national team debut against San Marino in February 2006, he was part of the team squad Luis Aragones with Fernando Torres and Raul Gonzalez. He also became part of the 2006 World Cup Championship in Germany, bertandem with Fernando Torres in the first game against Ukraine, he created two goals (one from the penalty spot). 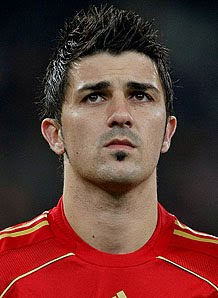 At the 2008 European Cup Championship, Villa became Spain hero in the preliminary round with a collection of four goals. Hat-trick when he printed La Furia Roja crushed Russia 4-1.